FEB 16: CONFESSIONS – 3:00 PM, VESPERAL DIVINE LITURGY (SN) – 4:00 PM, ; FEB 17: DIVINE LITURGY – 10:00 AM; FEB 19: 6TH HOUR & CATECHISM. 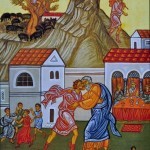 Today’s Gospel Reading is Luke 15: 11-32, The Prodigal Son and His Brother, which is the name of this Sunday. It is a story about a father and his 2 sons. The theme of the story is repentance and acceptance. The Prodigal Son is an image of each of us, as we “remember ourselves” and resolve to break with our sins, return from exile, and start a new life. The parable gives assurance that the Father will receive us with joy and gladness in our journey through Great Lent, our journey home.